Grapefruit trees (Citrus paradisi) resulted as a natural cross between a sweet orange and a Caribbean pomelo. An attractive subtropical tree even if it never flowered and fruited, the grapefruit typically matures 15 to 30 feet tall. Fragrant flowers occur from late winter to early spring and then develop into yellow skinned fruits with pink-red blush. If picked too early, the fruits bear an overly bitter flavor in the insipid flesh. After flowering subsides in mid-spring, grapefruits develop from the swollen flower ovaries into large grape-like clusters on branch ends. For best fruit and flavor development, grapefruits need a hot summer. Fruits take between seven and 18 months to properly ripen on the tree. Temperature is the primary consideration in determining the amount of time needed before fruits are ripen enough to pick and eat. Florida grapefruit season is not the same as grapefruit season in Southern California. In regions with long, hot summers such as southern California and the low deserts of Arizona, some varieties of grapefruit trees may be harvested in early to late autumn. Elsewhere, such as in Florida, gardeners hold off harvesting until the winter since exposure to chilly temperatures makes the acids turn into more sugars. By the following mid to late spring months of April or May, the fruits are fully tree-ripe and begin dropping from the tree. 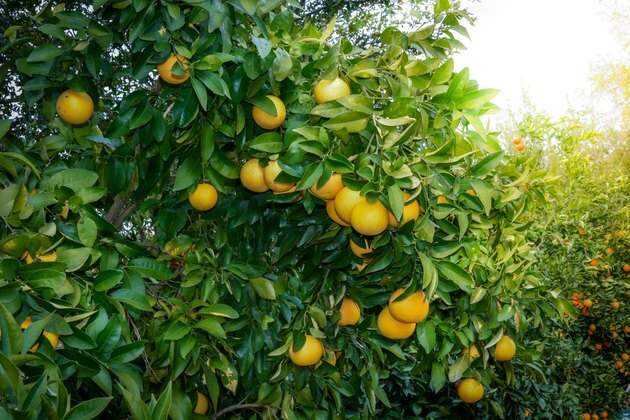 Besides noting the number of months the fruit has hung on the tree, ripe grapefruits begin to reveal characteristics that suggest time for picking. First, the fruits are large and plump in comparison to other, younger fruits. The leathery skin has already changed from green to light yellow and blushes of pink to rosy salmon exist. Feeling the fruit gives you insight, too. The leathery skin may begin to swell and buckle lightly when the flesh inside is full of juices. Lastly, sweet tree-ripened fruits begin to emit their distinctive fruity fragrance. Commercial grapefruit growers may clip the stem of the grapefruit to harvest it, but that's because they are often harvested prematurely and then treated to ripen at appropriate times for release to market. In the backyard citrus orchard, you can pull off ripe grapefruits by hand. A slight twist of the wrist is often all that is needed to pull it from the branch. If fruits linger on a grapefruit tree past mid-winter, it can reduce how many flowers occur a few weeks later into early spring. There's no need to strip the tree of all fruits, but eating ripe grapefruit across winter frees up energy for the tree to produce flowers and yield a new crop. Grapefruit trees always produce main flowering every late winter to spring. They won't postpone flowering if fruits persist until late spring and then naturally drop off. When Do Blood Oranges Ripen on the Tree? Why Are My Limes Turning Yellow & Falling Off the Tree? How Do I Know When Quince Is Ripe? When Are Clementines in Season?